Fariela Fuori "ORI" is new member of our scottish family since 19.3.2018. Young black femalecomes from connection out of Don Dexigo Majesco and April Majesco. 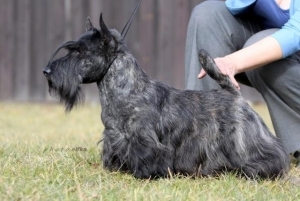 Immediately after presenting her inside show rings she several times won her actual classes and reached titles BIS PUPPY II at allbreed show and later titles BOB PUPPY and EUROPEAN FUTURE from European show in Warsaw, Poland. Ori reached her first juniorchampion title in 12 months.